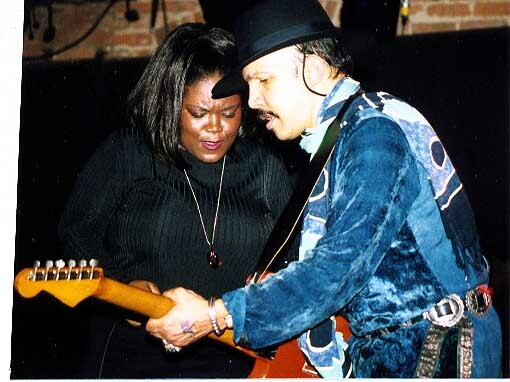 A benefit concert to help defray medical expenses arising from Amp Doctor Cesar Diaz’s recent liver transplant had an array of guitar slingers and stars rocking Manhattan’s Mercury Lounge on Monday, Dec. 21, 1998. Over the course of some five hours, a procession of players too numerous to list here delighted a packed house with an eclectic mix of blues, rock and soul--liberally laced with Dylan and Hendrix compositions. Event beneficiary Cesar Diaz--guitar amp and effects innovator and guitar tech to such stars as Bob Dylan and Stevie Ray Vaughan--took center stage several times during the evening. Diaz has incurred massive medical bills resulting from the transplant he underwent as a consequence of a congenital liver condition. All event proceeds went directly toward payment of Cesar’s medical bills. Beyond some four thousand dollars collected at the door, Cesar also received donations of a guitar from Bill Thompson of Counting Crows and an amplifier from Fender, U.S.A. Further donations,from a direct-mail appeal and other ongoing fundraising efforts, continue arriving. Also Lenny Kaye, and Jackson "Sonic" Smith, backed by benefit organizer Danny Shea’s house band, featuring David Bennet Cohen on keyboards. Organizers of the benefit say note that there is far to go before Cesar can make a real dent in his accumulated bills, and that his continuing treatments mean that the debt is still growing. Tax-deductible donations can be sent directly to a fund administered by the American Liver Foundation. See below for the address. "TWAS THE NIGHT BEFORE CHRISTMAS,WHEN ALL THROUGH THE HOUSE ALL THE GUITAR PLAYERS WERE PLAYING EVEN THE KEYBOARD PLAYERS WERE WOUND!!! THANK YOU !! 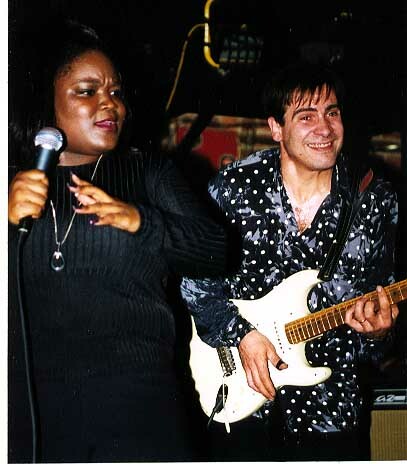 DANNY SHEA, DR. DEBORAH GARVIN, NICK KOUKOTAS,ANALOG MIKE, DANIEL JAKOUVOWITZ, JIMMY VIVINO, DAVID COHEN, BOBBY KYLE AND THE ENTIRE "JOHNNY COPELAND BAND" MRS. LYNN COPELAND, SHAMIKA COPELAND, LENNY KAYE, JACKSON SMITH, KENNY ARRONSON, ERIK AND BRETT CARTWRIGHT, DAN HOVEY, LINWOOD TAYLOR! DAMAN EPPLY, "BIG AL" GUERRERO, ALL THE PEOPLE FROM MILFORD,PA. YOU ALL KNOW WHO YOU ARE, AND ALL THOSE WHO CAME OUT OF THE WOODWORK TO HELP AND SUPPORT ME WHEN I WAS DOWN, COOKIE, BEV, BARBARA, BOB, AND THE ENTIRE DYLAN CLAN, YOU ALL MADE IT POSSIBLE! Big benefit concert for Cesar Diaz with surprise guests -- please come and help the man who made a difference in the Rock n' Roll sound. 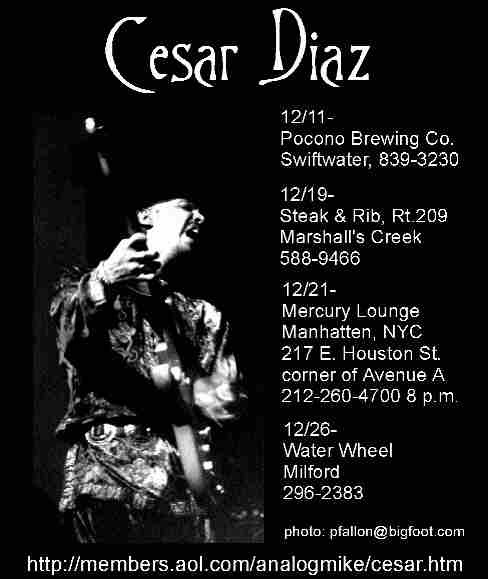 Friends of Cesar Diaz have scheduled a New York City benefit to help defrary massive medical expenses the guitar-amp innovator has incurred in the wake of a recent liver transplant. 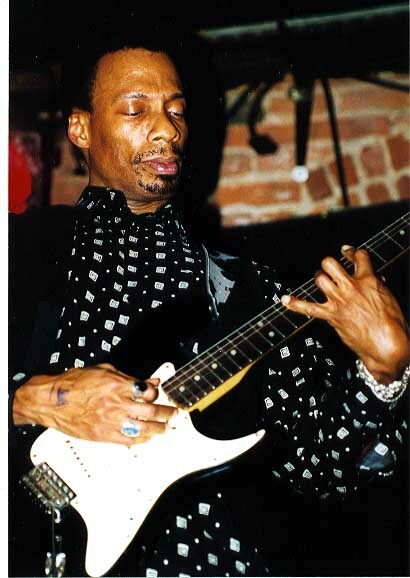 After rising to international prominence as a guitar-amp and effects builder--and for his work with such blues and rock luminaries as Stevie Ray Vaughan, Eric Clapton and Bob Dylan--Diaz's congenital liver condition required treatment by a transplant operation that has left him physically depleted and financially drained. The fundraising event--an all-star blues and rock jam hosted by guitar-collector extraordinare Danny Shea--is set for 8 p.m., Monday, December 21, at the Mercury Lounge, 217 E. Houston St. (corner of Avenue A) in Manhattan (phone: 212-260-4700). Admission is $20. All proceeds from the event will go directly to Cesar. Shea and his band will be joined by an array of area guitar luminaries--friends and clients of Cesar's--including Conan O'Brien's guitar man, Jimmy Vivino. Musicians interested in sitting in are encouraged to call Danny Shea at (212) 477-0295. A direct appeal for contributions toward Cesar's post-transplant expenses is also underway. For information about the fund, call (800) 465-4851. Attached is the article that just ran in the Skylands Blues Society Newsletter. Cesar Diaz, internationally-acclaimed guitar-amp innovator and guitar-tech to the stars, is struggling physically and financially in the wake of a recent liver transplant. The Skylands Blues Society and other friends of Cesar's are reaching out to support him through this ordeal. 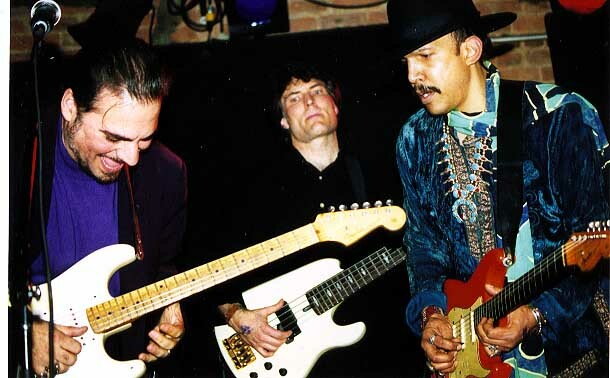 Through his career as an amplifier designer/technician and his work with such blues and rock luminaries as Stevie Ray Vaughan, Eric Clapton, and Bob Dylan, Cesar has played a significant role in shaping the voice of the electric guitar in contemporary music. Before the transplant, Diaz, a longtime resident of East Stroudsburg, Pa., and friend of the Skylands Blues Society, was diagnosed as having a life-threatening combination of liver problems, including congenital hepatic fibrosis and chronic Hepatitis C.
Beyond the usual difficulties associated with post-transplant recovery, Cesar is now also battling a further infection--a Hepatitis B virus from which the donor of his new liver apparently suffered. The extreme, and often conflicting, courses of medication required to simultaneously ward off rejection of the transplanted liver and combat the Hepatitis B have left Cesar physically depleted, financially drained, and capable of working for only a small portion of any given week. "Where something used to take me a half-hour to do, now it can take the whole day," he explained. The transplant hasn't, however, diminished his devotion to or passion for the music around which his life has been shaped. Shortly after his operation, and with surgical staples still holding his transplant incision together, Cesar travelled to Manhattan to perform at a memorial benefit for one of the numerous musical giants with whom he's been associated through the years--Johnny Copeland. Despite his debilitated physical and financial condition, Cesar is struggling to keep working and playing music. "The medication sometimes leaves me totally confused," Cesar said. "I lose my patience and concentration easily. Because the prednisone I take eats up the potassium in my body, sometimes I'll be playing guitar and my hands just cramp up so bad I have to stop." Though best known for his guitar-amp design and restoration work, and for the guitar-effect devices he's designed and manufactured, Cesar holds playing music closest to his heart. A fiery, passionate blues and rock guitarist, his playing reflects Cesar's 45 years of struggle and determination since his birth in Puerto Rico. He started playing guitar at age 6. Listening to records by Robert Johnson and Sonny Terry sparked an early love for blues music. In 1969 he came to the mainland with Johnny Nash (of "I Can See Clearly, Now" fame), before moving on to join Frijid Pink. In 1970, he met G.E. Smith, with whom he has been associated off an on over the years. During the seventies, Cesar played a major role in the then- developing market for vintage tube-powered guitar amplifiers. Guitar World magazine--the publication that dubbed him "The Amp Doctor--has characterized him as the "guiding light" of tube-amp restoration. Over the course of that decade, Cesar located, restored, and returned to productive musical use countless vintage tube amplifiers--and opened the ears of a horde of guitar players to hidden worlds of tone and expression they never knew could be drawn from their instruments. Cesar befriended the as-yet-unsigned Stevie Ray Vaughan, whom he outfitted with the amplifier/speaker setups on which that guitarist's sound would go on to conquer the blues world. "To this day, people come up to me at gigs and tell me I remind them of Stevie, even though I don't play like him," Cesar said sardonically. By the early eighties, Cesar was designing and hand-building prototype amps that would evolve into his own line of limited-production guitar equipment. Meanwhile, he continued locating and restoring vintage amplifiers for such guitar luminaries as Eric Clapton and Keith Richards. In 1986, G.E. Smith, who'd just joined Bob Dylan's band, brought Cesar on board to tend to the two guitarists' gear and tone. That began Cesar's six-year association with Dylan. After G.E. left the band, Cesar stepped into the guitarist's slot, playing some 50 dates with Dylan before stepping down to devote more time to his family and amplifier business. It was a short break. "I stayed home for nine months and they pulled me back--like Michael Corleone," Cesar said. Dylan called to rehire him to care for guitars and amps on the road.. Cesar stayed on in that capacity until 1993, by which time his liver ailment had been diagnosed and his health had begun to decline. Back home, Cesar continued to develop and manufacture amplifiers, along with high-end guitar effects--all hand-made, in small production runs. 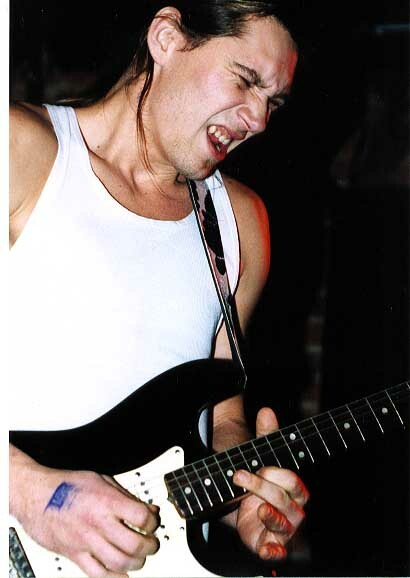 Numerous guitar stars cherish their Diaz amps. Richie Sambora uses his on the road and in the studio. Billy Gibbons and Jimmy Vivino (Conan O'Brian's guitar man) each own six Diaz Amps. The Tremodillo--Cesar's unique tremolo device--has been used on top-ten charting releases by Joan Osborne, Collective Soul, R.E.M. and other recording artists. The publicly-visible aspects of Cesar's contributions to the music-- such as album and interview credits from Stevie Ray Vaughan, Eric Clapton, Keith Richards, Neil Young and others--are just the tip of the iceberg when it comes to his impact on the sound of contemporary electric guitar. Any guitar player who has ever called on Cesar's services has come away from the experience with a whole new outlook on their instrument's voice and potential for the expression of musical feeling. Cesar's modifications of guitar pickups and his amp and guitar-effects innovations have been widely imitated by a whole new generation of equipment manufacturers. Throughout his career in the hardware end of the music, however, Cesar has continued to develop and grow as a musician. Among the goals he has set for himself, should he succeed in coming out of his current ordeal alive, is to get more of his own music out into the world. His work producing his pal Bobby Kyle's recent debut album is an example of where his creativity is pointing. Cesar and Lenny Kaye have been collaborating on some rock and pop material. Meanwhile, he has his good and his bad days. Getting out of bed to work when he can, trying not to wig out when he can't, and doing his best to be a good father to his 12-year-old son, Alex. His wife, Maggie, is the cornerstone of his daily life and convalescence. " She's a trouper," he said. "She's a saint and a great mother to our child." As his medical bills continue to pile up, Maggie is setting up an independently-administered account into which contributions toward covering those expenses will be solicited. Skylands Blues society web site. Link to Cesar's AMP DOC page with information on his super cool amplifiers.